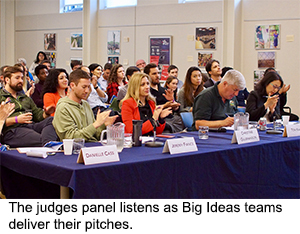 Big Ideas » Top Teams Compete at Big Ideas Grand Prize Pitch Day! 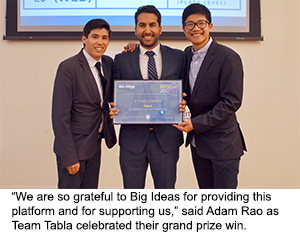 Top Teams Compete at Big Ideas Grand Prize Pitch Day! 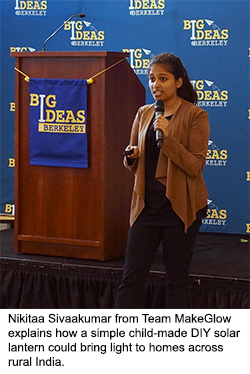 It was standing room only in Blum Hall Wednesday night as seven teams competed in Berkeley’s 6th Annual Rudd Family Foundation Big Ideas Grand Prize Pitch Day. Each year, the Big Ideas competition brings together teams of students from across disciplines to design creative solutions for social impact. This year, 326 teams representing more than 1,000 students from 16 universities submitted proposals. Of those, 44 teams were awarded seed funding for their ideas after two rounds of review, and seven were selected to present at Grand Prize Pitch Day. In front of a panel of high-profile judges comprised of industry leaders and social entrepreneurs, finalists described how their innovations would effectively address issues related to affordable housing, healthcare, human rights, energy, and waste management. These new and creative ideas included ventures that aim to bring light to rural India, more effectively diagnose pneumonia, and give a voice to immigrants who have been detained and deported. Former White House Deputy Director for Technology and Innovation and Big Ideas founder, Tom Kalil, was impressed by the caliber of contestants this year. “It’s great to see the ambition of students at Berkeley and other campuses to tackle major societal challenges – both at home and abroad,” Kalil said. Other esteemed judges included Christine Gulbranson, Senior Vice President of Innovation & Entrepreneurship, UC Office of the President; Danielle Cass, Silicon Valley Tech Sector Liaison, USAID; Jean Shia, Head of Portfolio and Investment, Autodesk Foundation; and Jeremy Fiance, Managing Partner, The House Fund. Each team was given three minutes to pitch their big idea in front of a packed audience. During the question and answer session that followed, judges asked tough questions about each team’s innovation, pilot methodology, sustainability plan, and implementation model. While nerve-wracking, teams relished the opportunity to dive deeper into their ideas. When the pitches were complete, judges retreated for 30 minutes to deliberate. Tabla (UC Berkeley, UC San Francisco): Pneumonia is the number one killer of children under five, globally. Tabla, an apple-sized device that costs $70, is a portable, accessible, and inexpensive diagnostic tool that will reduce child mortality in resource constrained settings. Point-of-Care Diagnostic Test for Preeclampsia (Duke University, Makerere University): Each year, 76,000 women die of preeclampsia. Team Preeclampsia developed a safe and effective urinalysis diagnostic tool for early detection of preeclampsia in low-resource settings, allowing women to seek treatment before symptoms become life threatening. ZestBio (UC Berkeley): The juice industry produces 20 billion pounds of waste each year. Team ZestBio turns orange peel waste into plastic bottles, reducing food and plastic waste, and carbon emissions. Undergraduate Lab at Berkeley (UC Berkeley): University faculty often seek research assistance with prior research experience, limiting opportunities for undergraduates looking to gain the experience they need to progress in their education and careers. ULAB helps freshman and sophomores gain lab skills and solve real world problems, building the next generation of social innovators. HomeSlice (UC Berkeley): Lack of affordable housing locks many—and particular young people—out of home ownership. HomeSlice makes it easier for people who can’t afford to buy on their own to buy in groups—empowering them to build their assets instead of being forced to rent. MakeGlow (UC Davis, Texas A&M University): 25% of India lives in the dark. MakeGlow is a low-cost solar lantern designed to teach students in low-income rural communities about the environmental benefits of using solar, while providing them with light for their homes. MigRadio (UC Berkeley): Over 3 million immigrants have been deported in the last decade. MigRadio is new podcast that explores immigration policy through the lens of deported immigrants who tell their stories in their own words. The Big Ideas contest is made possible by the generous support of the Andrew and Virginia Rudd Family Foundation. We invited you to join us at the Blum Center for the Big Ideas Awards Celebration next Wednesday, May 3 from 5:00 to 8:00 pm. RSVP here to attend the event. Big Ideas@Berkeley news and updates.